Content by Tony Macklin. Originally published on November 7, 2014 @ tonymacklin.net. Whiplash should "wow" its audiences. It should have them leaving the theater with that word on their lips. 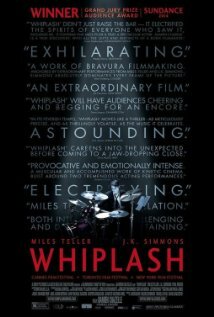 Whiplash is drum-pounding and heart-pounding. It's whip smart and full of emotional lashing. It's both intelligent and visceral. What a Rich (as in Buddy) combination. Whiplash is about the blood and guts of art. It raises the issue of "does the end justify the means?" And it almost beats it to exhaustion. But at the end there is a resolution that may challenge our preconceptions. It does it with flair, potency, and exhilaration. What is the price one must pay for trying to reach perfection? It's not fair or just, but it may be unavoidable. Andrew Neyman (Miles Teller) is attending a musical conservatory in New York City, and he is confronted by Terence Fletcher (J.K. Simmons). Fletcher is the leader and conductor of the vaunted Studio Jazz Band, for which there is furious competition. Fletcher is like a hard-assed football coach. He overpowers Andrew with his will, and the young drummer desperately seeks Fletcher's acceptance and admittance to the studio band. It's a vigorous, sometimes brutalizing journey. Only the few survive. With scars - both physical and emotional. But, ultimately, tempo is shared. Director/writer Damien Chazelle originally made Whiplash as an 18-minute short. It won the Sundance Short Film Jury prize in 2013. J.K. Simmons was in the short film. At the same time the short was made, Chazelle had a complete screenplay for a full-length feature that further developed the story. But he couldn't get the feature project funded until after the success of the short. In the feature film, Miles Teller replaces Johnny Simmons as the young drummer. It is a karmic change, because the chemistry between J.K.Simmons and Miles Teller is wondrous.They are both brilliant and invest their characters with substance and dimension beyond the page. And the page is pretty damned good. Chazelle has written a story with sharp, provocative dialogue. The dinner table discussion that Andrew has with his relatives about achievement has impact and irony. Andrew delivers the best blow. Whiplash has surprises, although how one death happened is predictable. Miles Teller is convincing as the human punching bag who has formidable resilience. He is a beacon of energy. Simmons at times has dead fish eyes, and at other times his eyes have a gimlet sparkle. Fletcher is a complex character. People may think that because Terence Fletcher is abusive, he is one-dimensional, but he is multi-layered, and Simmons increases the range of the character. Fletcher is obscene and cruel - insulting and demeaning -, but he is human. At one point he cries, and later he has a revealing discussion with Andrew about the motivation behind his withering modus operandi. Fletcher is vengeful, but excellence is his unwavering goal. I remember many students who didn't return after my first classes, but I also remember those who stayed and perhaps explored excellence. It ain't easy. But I was no Fletcher. About as abusive as I got was when a student would insist, "it's my honest opinion." Then I might respond, "Yeah, it's honest, but it's stupid." And it may be hard for some people to accept that artists and their work may be more important than students. Saxophonist Charlie Parker and drummer Buddy Rich are the two music icons honored in Whiplash. I've visited Buddy Rich's grave site in Westwood, California. It's in the same wall as Marilyn Monroe's. They last far beyond their graves. They played to different drummers. As in Whiplash, tempo endures.